The last thing you want to do when arriving at Gran Canaria Airport is to start thinking about car hire! To be honest you just want to get to your accommodation as quickly as possible….right? So here at Gran Canaria Car Hire we aim to provide you with an essential guide to car hire on the island. That is why we recommend that you spend a few minutes now comparing what is on offer. We compare the market and have access to all the major rental companies in Gran Canaria and can secure a very competitive rate for you. To arrange a Gran Canaria car hire is easy! Just fill in the dates and time you require and see the variety of rental offers available! What type of car do you want to rent from Gran Canaria Las Palmas Airport? First thing to consider is how many passengers are in your group travelling with you? What are their luggage requirements? Also how often will you use the car? For example are you just wanting to get to and from the airport or do you wish to do some sightseeing to various parts of Gran Canaria? Their are small cars offering good value just to get you around or are you after a more spacious car with a little more comfort? Please note: the size and style of the rental car you choose will determine the price of your car hire in Gran Canaria, as well as the fuel charges, insurance, etc. If you plan to visit some the hidden gems that the island of Gran Canaria has to offer, including driving through the little narrow streets in the many villages, then you want something small and compact, like a Fiat 500 or Ford Fiesta, however, if you are travelling with children and lots of luggage then something bigger would be ideal, like a Ford Focus estate or a VW Golf may be more suitable. Something else to think about. If you are the ‘relax by the pool’ type, then you may not get much use out of a hire car. In this case, a Gran Canaria Aiport Transfer might be a better option. If you prefer to tour the island at your leisure and visit places at your own pace, then Gran Canaria car hire is the option for you. Places in the North like the capital Las Palmas de Gran Canaria are beautiful, while in the South there are the sand dunes of Maspalomas which are spectacular and a definite favourite with visitors to Gran Canaria. Also the picturesque town of Mogan often called “Little Venice” with its canals and bridges are easy to visit when you have a rental car. Some people just do not plan ahead, or do not have the time to plan ahead. Maybe you have just decided to take a last minute trip to Gran Canaria and you will just go to the nearest car rental desk at the airport to book your car. However, be aware that prices and terms and conditions of the different hire companies can vary greatly. To be fair this is not the time to start comparing what is on offer. It is certainly beneficial for you if you can plan ahead, even if it is the day before travel. If you can pre-book a car this will save you a fair amount than just booking at the airport car rental desk. Using a comparison site for Gran Canaria car hire. Most of us are familiar with comparison websites and find we can get a good deal in our search for the best offer. If you have never used a comparison site, you will find the process very easy. You simply decide your dates and enter them in the calendar and instantly the site will collate the best quotes from different Gran Canaria car hire suppliers and show you the selection of vehicles available. We recommend you do this search and book your car rental as early as possible to get the cheapest deal. The search results will present you with a long list of available cars with all the information you need to make a good decision. This will include the type of vehicle in picture form, the price, how many doors the vehicle has, how much luggage space, and where to collect the car, either on-site at the airport or off-site. For extra information about a particular car, just click it and it will take you to a new page dedicated to that car and car agency. Another good advantage of using a comparison site is that you can filter the result to best suit your needs. This saves you a lot of time scrolling through all the cars available. You can filter by price, customer rating, size of car and this makes the whole process quite easy. We provide an easy step-by-step guide on our How To Rent a Car with Gran Canaria Car Hire Guide page. So now you have found your ideal car and are happy with the price, there are some other factors that you need to bear in mind. For example, the type of insurance that meets your needs. What fuel policy best suits you, and to be aware of any additional charges that you may incur. For Gran Canaria car hire comparison, use the “Search for Car Rental” box at the top of this page. Also you can use other comparison sites like travelsupermarket.com, skyscanner.net, or dealchecker.co.uk. Don’t leave it to the last minute. Gran Canaria gets busy! When searching for a car, remember that sometimes the picture may show a Ford Focus, but the car you are assigned will depend on availability. You will notice that it states “Ford Focus or similar” at the top of the search results. Sometimes you might even get a free upgrade to a higher spec car! The nearer you get to the start of your holiday, prices will increase and availability will decrease. So to get the best deal and choice….book in advance! Avis, AutoReisen, Enterprise, Eurocar, Goldcar, Hertz, Interrent, Rhodium, Sixt, Thrifty, Top Car. Note: Your pick-up location can save you money. Off-airport sites that require a shuttle bus generally are the cheaper option, while on-site airport locations are more expensive but are very convenient. 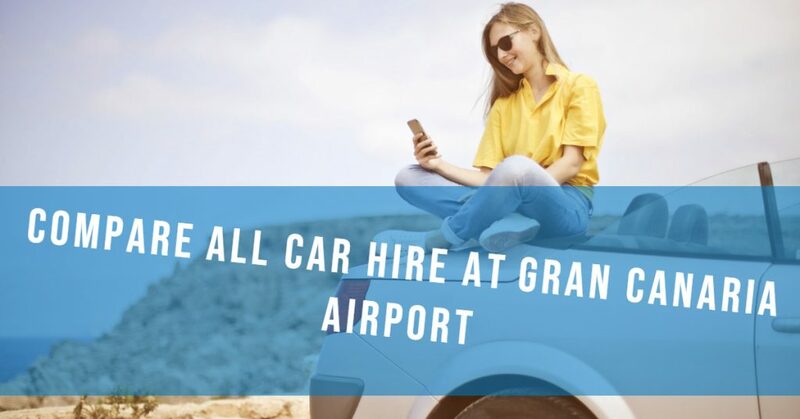 No one really likes to read through all the small print in a companies T&C’s, but we urge you to do so when hiring a car from Gran Canaria Airport or any other place. Before leaving the desk, ask the agent about anything you do not fully understand or are unsure about. The agent behind the desk will do his best to explain to you the policy but remember it is his second language so do not let things get lost in translation. Our advice is to double check the policy to make sure it is what you agreed too. Please be aware that all agencies will charge you for any speeding, parking violations that they will incur while the car is under your care. Check the car hire company’s fuel policy. There are a number of different fuel policies out there and it can be rather confusing to find what is best for you. At the time of booking select your fuel policy. Hence it is important to understand your car rental company’s fuel policy before you book with them. The car upon collection will have full tank of fuel in it and you should endeavour to return it empty. At the rental desk they will charge you for this full tank of fuel. They will charge you a slightly higher rate per litre than you would of paid at a local fuel station. The extra you pay on a full tank can add up but may be worth it for the convenience of having a full tank and not having to worry about filling up as soon as you leave the airport. Return the car with an empty tank as you will not get a refund for any fuel in the tank. So if you just want the car to get you from the airport to your accommodation and back again, this fuel policy may not be the best for you. This is similar to the above policy but means that you will get a refund for any unused fuel minus an administration fee. Your hire car is supplied with a full tank of fuel and you return it with a full tank of fuel. Again they will charge you at the rental desk a slightly higher rate per litre than you would of paid at a local fuel station. Make sure that the tank is totally full before you leave and if not make this clear to the hire company who will then make the adjustment. With this policy you will be asked for a fuel deposit that will cover the cost of any fuel and any admin charges if you do not return the car with a full tank. If you return the car full and does not require any fuel then your deposit will be totally refunded. Aeropuerto De Gando, Lado Aire, 35230 Telde, Las Palmas, Spain This is the closest to the terminal building approx 400m South. El Paso 2000 service station right near the airport just on the GC-191/Av. De Carlos V which is off of Junction 18 and again slightly south of the airport. This is the area of car rental that can be quite confusing as there are different offers to choose from that cover different requirements. Picking the wrong insurance can have a big impact on the final cost of the car hire. The price you see quoted for your car always includes a basic insurance cover. This basic insurance will cover you for damage, theft and third-party, cancellation and amendments but comes with an excess which means you have to pay an initial contribution towards a claim. Depending on the damage to the car this excess you have to pay in a claim can be expensive and cost more than the actual car rental. At the desk they will ask you for your credit card, to cover this excess. This excess payment on the card will not be processed, it is just blocked from your card and when you return the car undamaged the excess block is removed. That is why many hire companies will ask you to consider Excess Insurance Cover. This is extra cover you can buy so the rental company does not take anything from your credit card. This insurance cover will either partly or fully cover the cost of the excess in the event of damage to the car. Break-down cover may also be included which is a bonus. The rental company will offer this extra Excess Insurance Cover, and if you buy it from them then your credit card will not be blocked for the amount of the excess. Alternately if you have bought this extra Excess Cover with a third-party company the car hire company will still charge any cost incurred for the repair of the car to your credit card and you will need to claim a refund from the third-party Excess insurance provider. The comparison website on this page gives you the option to buy Damage Refund Insurance cover that covers damage, theft, tyres, windows, wheels, key cover and personal possessions. This will be with a third-party provider and considerably cheaper than what they charge at the rental desk. So when they offer you excess protection at the desk, there is no need to buy from them as you already have the Damage Refund Insurance cover. If you want to check out some deals for excess insurance, use the comparison search box at the top of this page. Basic insurance is included in the car rental price but comes with a hefty excess that is blocked on your credit card. To cover for this excess you can take out excess insurance cover with the car hire company itself when you collect the car. This will prevent any block on your credit card but is the more expensive option. Alternatively you can use a third-party provider that will cover for the excess and can be bought and paid for at the time of making your booking online. This is a cheaper option although a block is still put on your credit card by the hire company. If any amount taken from your card due to damage etc, then this can be claimed back from the third-party insurance provider. You may want to read “Car Hire – Credit Card and Debit Cards” for further helpful information. Drivers must to be 21 years of age or more. If under 25 years you will likely be charge a supplement. Senior drivers may be charged a supplement. It is a good option to add another driver to the policy so as to share the driving. Any additional drivers will need to bring their driving licence. Rental companies vary is their charges for this option, but sometimes this is offered free of charge. Rental desks are not open 24/7. Remember to check what time you are arriving. Most car hire companies charge an out of hours fee, this is usually after 11pm and before 7am. Check what they charge if they do offer this service and check how frequent their shuttle bus is operating. However, be aware some car hire companies do not offer out of hours collection or drop-off. Avoid being charged for an extra day. Return the car an hour earlier on the day, so your rental period will not go in to another day. There are a number of optional extras that you can select to add to your car rental. Be selective of what you really need. These extras are generally charged for the duration of the rental agreement. Tip: The cost of renting these optional extras can add up. What are the options? Maybe you can bring over your child car seat free of charge on the airline you fly with? Do you really need a Sat Nav or can you use an app on your mobile phone? Sometimes the unexpected happens and you have to cancel. The good thing is you can usually cancel the booking within 48 hours of your pick-up time and you will not be charged a fee. Remember if you bought extra insurance with a third-party you need to cancel this also. It is worth checking the company’s cancellation policy before you book your car hire. Select “Cancel Booking” and/or “Cancel Insurance”. You will receive a confirmation e-mail of your cancellation and a full refund if applicable. If you made your booking online it is recommend you cancel it online. This is easier than calling them regarding the cancellation. To ensure a speedy process make sure you have all the documentation required, this includes your driving licence, credit card and if you are travelling from the UK you will need to apply for a code from the DVLA that is valid for 21 days and this needs to be presented at the car hire desk. It is helpful that you have a rough idea where the desk is located whether it is in the airport site or off site. You will find directions to the rental desk in the email. Once you have the car keys in your hand you just want to get on the road. However, it beneficial to note a few extra things before you set off. First thing to remember is everyone drives on the right side in Gran Canaria, as in the rest of the Canary Islands. This is important to remember. Before you set off locate where the headlights, side-lights and indicators are located. Position the mirror and side mirrors so you have a clear field of view on both sides. Remember everything is the opposite so proceed in an anti-clockwise direction. Best advice is to drive slowly and stay in the lane. If the slip road is too short you will have to stop and wait until it is free of moving cars before you enter the motorway. Enter on the slow lane to the far right. The island is good for road signs and gives you a good sense that you are driving in the right direction. The roads inland are more challenging but a Sat Nav can often get you to your destination. The fuel pumps are colour coded with green for unleaded petrol and black for diesel. Some Petrol/Gasoline filling stations may require pre-payment before the pump will operate. credit cards are generally accepted for payment. On the motorways, you will find emergency telephones linked to an SOS telephone network at intervals of 2km. The emergency telephone number is 112. The last thing you want is to get a parking fine because you did not fully understand the signs or lines on the road and what they mean. Again a little advance preperation can go along way in making your driving and parking experience an enjoyable time. Yellow line on road: Single unbroken yellow lines on the side of the road mean absolutely no parking. Blue lines: these indicated you can pay a parking fee and this is paid at the nearest ticket machine. White lines: Free parking allowed. No parking signs: these are frequently found on garage doors and driveways. They will usually have the words “prohibido estacionar” or “vado permanente” – Be warned – do not park here as your car will be towed away and you will have to pay the fine to release it from the compound plus a fine for each day it is in the compound. Disabled Parking: This is marked by a wheelchair symbol. Just a point on parking in Las Palmas. Finding a space to park on one of the roads is nearly impossible so our advice is that you use one of the many underground car parks or multi-story car parks. Even though these are more expensive, they are well worth the extra expense as you avoid wasting your precious time driving around looking for a space on the road. You can be fined if you go over the time paid for. However you can get this waived at the nearest ticket machine within the hour of the expiry time. If it’s too late for that, the best thing you can do is to pay the fine immediately before your car hire company becomes involved – otherwise you will be charged an additional administration fee by the hire company. The fine is reduced by 50% if paid within 20 days of it being issued. How can I pay my parking fine? Easiest way is to go to one of the banks listed on the fine ticket. They will issue you with a receipt of payment and you can show this upon return of the car. If you prefer to pay online, you can do so via the local authority website, but these websites are not usually in English and can be confusing. Appealing a fine in Gran Canaria. Don’t bother! This is virtually impossible to do unless you are a resident on the island. It is not worth ther effort and you lose the option to pay early with a reduced fine. The laws for driving are very similar to U.K laws and most European traffic laws. Still it is good to remind ourselves of the local laws in Gran Canaria. Do not be fooled by thinking that as a tourist you will be shown some leniency. There’s a zero tolerance policy on drink driving on Gran Canaria and the police do carry out roadside checks. On Gran Canaria, the alcohol limit is 0.5g, but it is better to refrain from drinking altogether if you are driving. A driver can be banned from 1-4 years depending on the situation. Do not refuse to be breathalised. The police may also test for drugs if they suspect a driver is under the influence. The speed limit in towns and cities is 50km/h unless otherwise indicated. Some of the main road are 80km/h – 100km/h depending on the area. They are always signposted with just a 80 or 100 meaning kilmetres an hour. On the motorways the limit is 120km/h. These are enforced by speed cameras and average speed cameras. For your small child a child safety seat is required if the child is under 135cm. Children under 12 years and shorter than 135cm need to sit in the back seat of your car. Seat belt must be worn by all in the car. Do not be tempted to use your mobile even while waiting at traffic lights. You could be fined for wearing beach flip-flops or driving without wearing a shirt as this would be an infringement of not wearing the proper clothing or footwear when controlling a vehicle! If you wear glasses to correct your vision you are also required to carry a spare set with you. You must have a driving licence with you at all times and have your passport/ID residence card. If you fail to show your licence if pulled over, you could get an on the spot fine of €150-200! Keep your insurance and car rental documents close at all times. You will notice on the roads that many will have a solid white line running down the centre of the road. Do not cross this line to over-take the car in front of you. Do not cross this line if you need to turn left. Wait until the line is intermitent. In tunnels you must use your headlights even during the daylight hours. If you breakdown you are required to use the safety triangle usually stored in the boot of the car and placed some distance away at the rear of the vehicle. Also a driver must wear a fluorescent jacket to get out of the car on a motorway or busy road. Allow a little more time than anticipated when returning your car. Often the drop off zone is busy so please allow for this. It is good to mentally have an idea where in the airport you are to drop off the car. This can be done when you collect it by asking at the desk. Also as you leave the airport look out for signs about Car Rental Drop Off. When you return the car, try to have it signed back in and ask the person inspecting the car to confirm in writing that it has been returned without any new damage. Keep hold of your copy of this agreement in case you need it when you return home. You will also want to make sure that the person takes a record of the fuel in the tank. If you have agreed to drop the rental car back out of hours, you need to leave the keys in a postal key box and leave the car in the correct parking bay. This means that your car won’t be inspected until the the next day. If anything happens to the car in this time, you will be liable for any damage so carefully park the car. Most of the time your car rental experience goes trouble free, but there have been horror stories about the fuel not refunded or deposits not being returned. TIP: It is good practice to take a picture of the fuel gauge and photos of the car if you are bringing it back out of hours, or if there is no-one around to inspect it. On your return home, check your credit card statements to make sure that any refunds you were due (e.g. for unused petrol) are paid in full and that no extra charges have been slipped through. Some car hire companies have been known to charge you for accidental damage to the car (which was only discovered after you had returned the car! ), amongst other things. You can challenge such charges and ask to be sent evidence of the damage and an explanation of how the repair cost has been calculated. This should normally happen before your credit card is debited but unfortunately this is not always the case. Offers can vary between car hire companies in Gran Canaria – use a price comparison website. Prices do increase the nearer you get to the beginning of your holiday. Book online and well in advance. Using a credit card over a debit card gives you more choice in what car to hire and choice of rental agencies! It is faster and less hassle! Remember the name on the credit card should be the name of the driver. Make sure you have sufficient funds in your account. If you buy insurance directly from your car hire company at the airport desk is generally more expensive than booking it online using a third-party supplier. Think beforehand what extras you really need. Don’t be pressured in to buying extras you do not require. Try to arrange the drop-off time at least one hour earlier than the pick-up time so that the rental does not go in to an extra day. Remember if you collect and drop off the car at the airport although being convenient, it will increase the cost of the car hire. Alternatively a rental company near the airport that provides a shuttle bus will be a cheaper option. Always read the contract carefully and question anything you do not understand before you sign it. Make sure nothing has been added without your knowledge. The sales person at the desk may try really hard to sell you extras that you do not need. Try to be firm and polite and resist their sales pitches. This is very important! Inspect the car carefully on pick-up and make sure any existing damage or scratches are marked in your paperwork. When you return the vehicle to Gran Canaria Airport, have it inspected again and get confirmation that it has been returned without any new damage. When you get home remember to check your credit card statements to make sure that any refunds you were due are paid in full and that no extra charges have been applied without your consent.